Domestic violence caused Mary and her teenage son to flee their home with just the clothes they wore. However, the trauma of the initial flight has been nothing to the relentless need to find somewhere for the family to live. Mary* has a wide smile and an easy laugh. As she recounts her past three years, I marvel at her good humour and strength. ‘Believe me, I’m not strong all the time. I’m a very determined person but sometimes I sit at home crying. But if I can get through this, and if by speaking out about it helps people, then I can feel that I’ve achieved something’, she says. Even before she fled her home, her life had not been easy. She is a cancer survivor, having had operations on her lung, stomach and bowel, and still has spells in hospital. She and her husband were farmers, a career subject to the vagaries of weather and pricing. However, their eldest was doing well at university and their youngest was set to complete Year 12 when life changed irrevocably. CentreLink put her on to someone who ran an emergency shelter. As a result of the cancer, Mary needs to be hooked to a machine 16 hours a day. Mary doesn’t have family in Australia and says it was difficult with friends. ‘It was a small rural community and everyone knows everyone. The common responses were “we don’t get involved with other people’s problems” or “I don’t take sides”. I never asked anyone to take sides or to get involved, all I wanted was a bed and friendship. It was about two weeks before Mary told her daughter in Melbourne what had happened. After her son completed his Year 12, Mary and her two children moved to another country town and rented. Though more than they could afford, they needed somewhere to live so the children could pick up their lives. Mary’s son passed Year 12 and began an apprenticeship, while her daughter got a part-time job. It was during this time Mary became involved with Vinnies. Mary had intervention orders against her husband, but after he tracked them down, Vinnies helped the family to get to a safe house in Melbourne. Mary and the family had the safe house for a year, which gave her son a chance to find another apprenticeship and though her daughter has anxiety, it was also a chance for her to get her footing. Legal Aid is not available if it’s anything to do with finances, so Mary has become her own solicitor and barrister, chasing her husband for money he was ordered to pay by the courts to cover rent for three years. Her husband paid for a year until the intervention orders ran out and now Mary has spent a year doing paperwork to have the court order enforced. 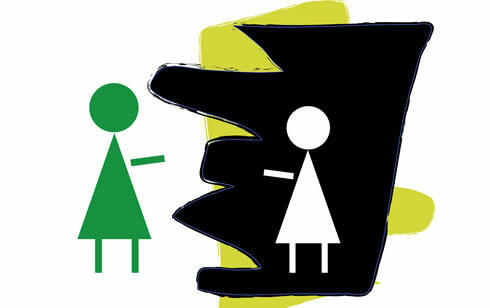 Mary’s story is not unique. The latest figures released from the ABS show a frightening picture of homelessness across Australia, with three key groups affected – youth, Aboriginal and Torres Strait Islander and those displaced due to family violence. On census night 2016, 116,427 people were counted as homeless. Mary said it was those doors that close on you that’s a problem when you seek help. ‘People don’t tell you where to go or where to get help, and you don’t know. You don’t even know the questions to ask. It’s so confusing, and mentally you’re not in the right space. There has to be an easier way for people to access help. Vinnies annual CEO Sleepout ‘Poverty: Home Truths’ will be held on 21 June 2018. 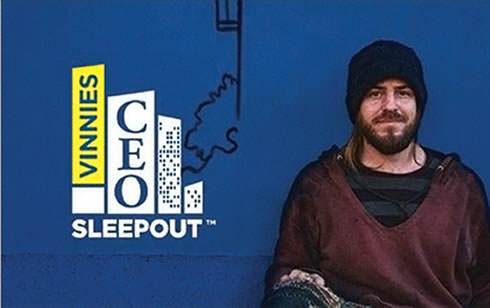 Eradicating homelessness is everyone’s responsibility, nominate your leaders or donate to ceosleepout.org.au.